Eyeglass strap set: The glasses strap is 70 cm/ 27.6 inches in length and 0.15 cm/ 0.06 inch in thickness, in 6 colors of black, grey, red, purple, green and dark brown. Colors coordinate your eyeglass holder strap with your dress. Fit for both men and women, will match any item from your wardrobe. These glasses holders are made of PU leather, the tough but soft and pliable leather will not fray or break easily, can serve for long time. Adjustable strap ends with metal coils, simply move the silvery coiled, can hold tight to the ear wires of your glasses, unable to fall off. Lightweight Material - Made with top quality PU leather material, Soft cords make no more scratched up lenses when you rafting, running, boating, playing basketball or golf, on vacation excursions, etc.. Perfect for Adults and Children, hanging around your neck when not in use. 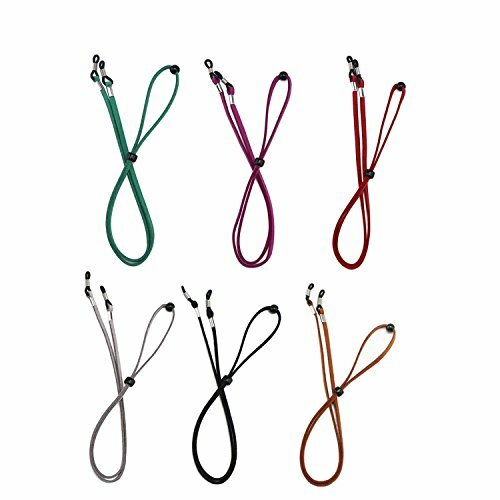 Strong And Elastic Cords - Adjustable toggle on elastic cords ensures that straps will not easily fall off and are comfortable for all head sizes and shapes. This glasses necklace provides strength to keep your eyeglass holders around neck seamlessly. Never Lose Your Glasses Again - Whether it's sports, travel or party, it is your favorite best partner for glasses. You can use silver-plated coils with rubber clips, easy to install and disassemble, easy to use and high elastic rubber head firmly fixed on both sides of the temples, not easy fall off. Wide Uses - This eyeglasses-neckline keeps your glasses safe on your neck, sunglasses hanging comfortably on your chest, or on top of your head. From small to large frames, these eyeglass chains and cords for men and women strap provide universal compatibility fitting optical frames, reading glasses & sunglasses. Service With A Smile - We pride ourselves on that. We want you to know that you matter to us here at segarty. We would offer you 100% risk-free satisfaction guarantee to let you buy with confidence; no questions asked. YOU are our number one priority! If you have any questions about this product by Segarty, contact us by completing and submitting the form below. If you are looking for a specif part number, please include it with your message.